Why Might Hedgehogs Eat Their Bedding? What Is This?—Hedgehogs are inquisitive by nature and often attempt to learn about their environment by tasting and smelling. Baby and young hedgehogs are very prone to eating new brands or types of bedding. Hedgehogs that eat a single piece of new bedding and spit it out or self-anoint with it are most likely eating it out of curiosity and will discontinue doing so once they realize it isn’t food. Self-Anointing—Many hedgehogs will ingest new bedding to create a froth to self-anoint. Hunger—Hedgehogs with drastically reduced or inadequate diets may eat bedding to attempt to satisfy hunger. Nutritional Deficiency—Some believe animals eat things in their environments to try to supply something lacking in their diets. The most important thing to do is to monitor how much bedding your hedgehog is eating and to try to discourage your hedgehog from eating more bedding. Offer additional treats or additional staple diet to encourage the hedgehog to eat food rather than bedding. Immediately remove bedding if you notice your hedgehog eating multiple pieces of bedding. Ingested bedding can cause serious abdominal impactions, or blockages in the intestine, that can lead to death. Always keep an eye on your hedgehog’s appetite and stool after it eats bedding. Your hedgehog’s stool should remain a relatively good size and should be well formed. Very small stool, diarrhea, or straining while defecating could be signs of an impaction. The best solution is prevention. 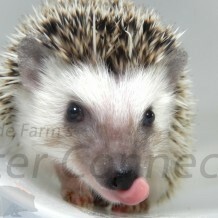 After purchasing a baby hedgehog, try to use the same or similar bedding as your breeder. For instance, if your breeder uses Aspen Shavings use Aspen Shavings or Pellets. Many breeders use kiln-dried pine shavings, so if yours does, you should too. Baby hedgehogs not previously exposed to paper pellets have a greater tendency to eat bedding than babies raised on a paper product. Plain clay kitty litter is less likely to cause an impaction than is paper pellets bedding. Clay passes through the digestive system, but paper pellets expand when wet and can block the intestine.